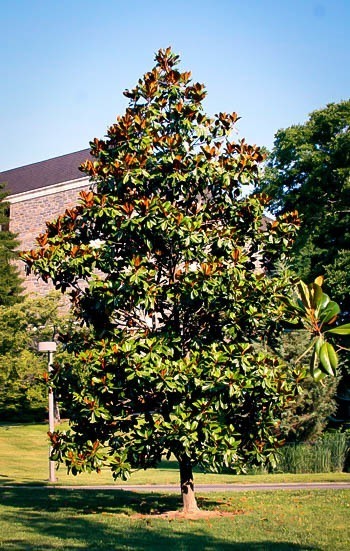 If you have admired the beautiful evergreen Magnolias of the south, but thought you were too far north to grow one, the Edith Bogue Southern Magnolia could be the tree for you. This hardy form will withstand minus 5 degrees and even more, making it a perfect choice all the way to the Great Lakes. With its glossy leaves all year round, this Magnolia is always beautiful. As summer comes enormous white blossoms up to 12 inches across tip the branches with fragrance and beauty. Easily grown, long-lived and hardy, this tree will delight you with its decadent summer beauty. Flowering at an early age and growing steadily, you will enjoy this southern charmer from the moment you plant it. 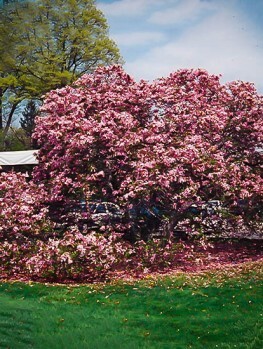 Flowering trees are always an attractive feature for your garden and the Magnolia is a long-time favorite. A broad-leaved evergreen known for its bold flowers and a part of our natural landscape, this tree has been commemorated on US coins and in many other ways through the nation’s history. That’s just one of the many reasons it deserves a place in your garden though. There are hundreds of Magnolia varieties, in a range of shapes and sizes to cover any situation, so you’re guaranteed to find one that suits you perfectly. 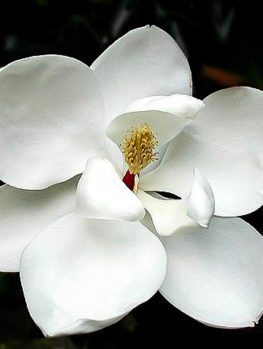 Magnolia grandiflora, or the Southern Magnolia, is found in the southeastern USA from Virginia down to Texas, and its range extends inland to Oklahoma. Wild trees can grow to 120 feet tall or more, and the timber is valuable for making high quality furniture. Ornamental varieties tend to be smaller, although often still impressive; the Edith Bogue cultivar is a fairly typical example of a larger garden Magnolia, but a very attractive one that offers the possibility of having a Magnolia tree further north than is usually possible. 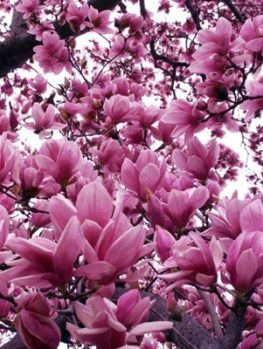 The Magnolia is a southern tree that does best in warm, humid climates, but the distinguishing feature of Edith Bogue is that it handles colder winters better than most other varieties. 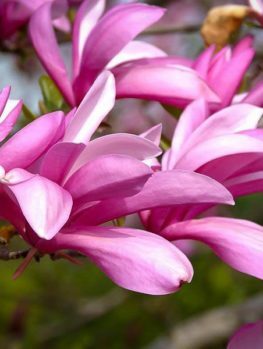 Suitable for USDA plant hardiness zones 6 to 9, this tree will grow well through the Magnolia’s traditional range but can also thrive further north in locations like Saint Louis, where most Magnolias would quickly expire in winter. Towards the northern limits of its range, it does tend to shed some leaves in harder winters but will recover with new growth in spring. This variety prefers partial shade as a younger plant, although its size makes this more difficult to achieve as it matures. Look for a spot near your home that gets sun in the morning but shade in the afternoon, if possible. As far as soil goes, you’ll get the best results in organically rich loam that’s moist but well-drained. This isn’t a tree that likes extreme soil conditions, either too wet or too dry, although it becomes slightly more drought-resistant as it matures. It’s best to protect the root system in warm weather by spreading a four-inch layer of organic mulch and keeping it damp. The Edith Bogue can also be affected by urban air pollution, and tends to do better in suburban or rural locations. On the other hand it has few problems with disease or insects. The first seedling of this variety was bought in 1917 from a tree breeder in Florida by Edith Bogue, who gave it its name. 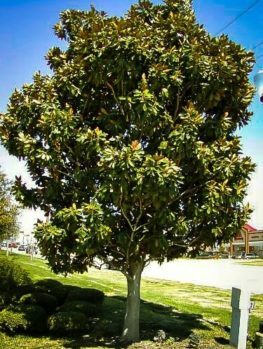 This is a full size Magnolia tree that usually grows to between 40 and 60 feet high, and reaches a width of 20 to 30 feet. 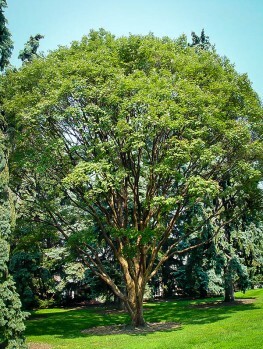 Its crown is usually rounded or pyramidal and larger ones can make good shade trees, although in younger specimens the lower branches are usually too close to the ground. However, even a smaller tree is ideal for providing some shade to more delicate shrubs or plants that can find refuge from the sun under the Magnolia’s spreading branches. 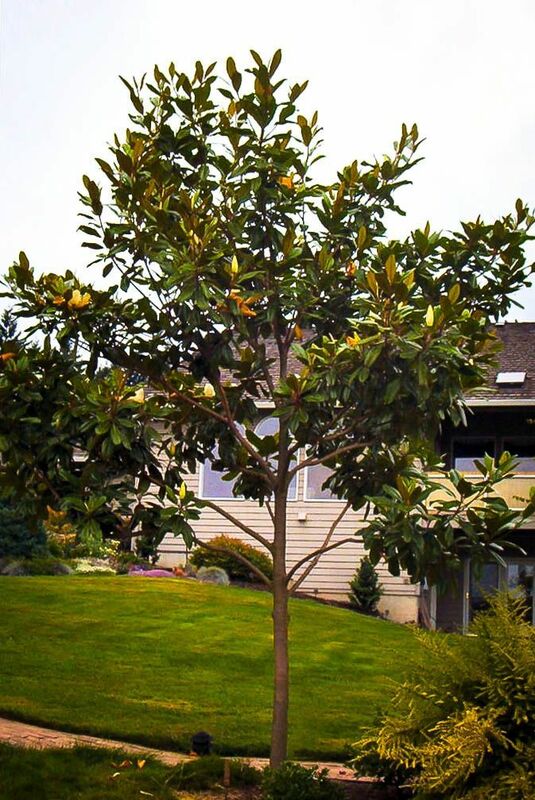 That shade is maintained all year round, as the Magnolia is permanently covered in its distinctive foliage, with large, oval, leathery-looking leaves that can grow to ten inches long. Those leaves are a dark, glossy green on top while the underside can vary from pale gray to a much darker gray-brown. Folk wisdom claims that trees with brown leaf undersides do better in cold weather, but botanists haven’t managed to confirm that so far. However, the Edith Bogue variety is really distinguished by its large creamy-white flowers. These usually have six petals and can be from eight to twelve inches in diameter; they appear as a vivid display in late spring, but the tree will continue to flower less densely through most of the summer. Late in summer the flowers are replaced by seed clusters encased in fleshy coatings, which finally mature as fall approaches to release colorful bright red seeds suspended on individual threads. 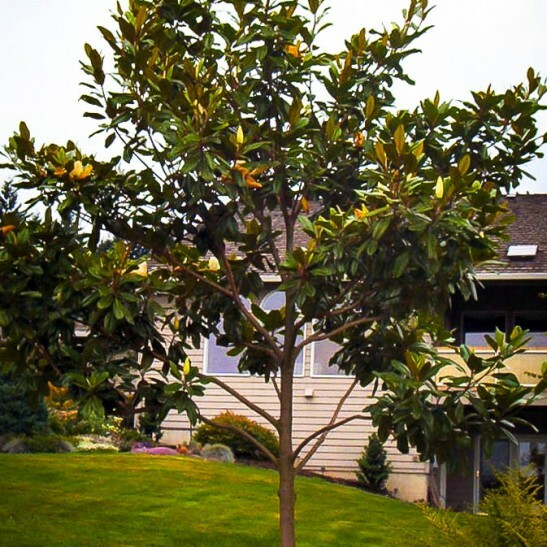 The Edith Bogue Magnolia is an extremely attractive tree that will brighten your garden in spring with its showy flowers; these also release a pleasing lemony scent. The persistence of the flowers into summer is a nice bonus, and while the foliage stays green in fall the red seeds add a touch of interest. They’re also a useful food source for wildlife; expect the butterflies and bees which are attracted to the flowers to be replaced by birds and squirrels as the seeds begin to ripen. 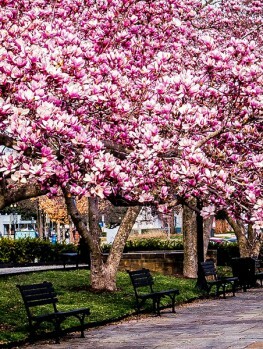 Of course a major benefit of a Magnolia tree is its evergreen nature, so it will continue to enliven your garden while other plants sink into their winter sleep. If you want the many benefits of a Magnolia tree but live too far north for other varieties we highly recommend the Edith Bogue.